A cultural day out in Glasgow discovering the delights of GOMA, Riverside Museum and Kelvingrove Art Gallery & Museum. Once-upon-a-time, before I was mummy to a hairy-faced laddie, I loved a trip to Glasgow. Since the Wee White Dug’s arrival my spare time has been spent exploring Scotland’s remote corners. I’ve missed Glasgow, so when I was invited to head west for a day of culture visting Glasgow’s GOMA, Riverside Museum and Kelvingrove Art Gallery and Museum I jumped at the chance. Mr G who’s ruled by his stomach was happy to accompany me. We boarded the 8:52am train from Edinburgh, supping on sugary gingerbread lattes to boost our flagging energy levels. It’s difficult to muster up energy during eat-till-you-burst season! We eased our way into the day with breakfast at Kimble’s Chocolate Cafe. Kimble’s was founded in 2002 by John and Joyce Kimble. During our visit we met their son Chris who also works for the family business. Once seated we perused the enticing menu. Well into the stride of eat-till-you-burst season I was tempted by everything on the menu. I finally narrowed it down to Eggs Benedict and Mr G chose Eggs Royale. As we waited for our food Chris brought us a selection of the shop’s Belgian chocolate to sample. We wouldn’t normally eat chocolate for breakfast, but it was twixmas and our blood was coursing with sugar, so what the heck! They were delicious – raspberry, strawberry, apple & pear, hazelnut, coffee. Mr G and I shared each chocolate – oohing and aahing our way towards a sugar induced coma. After devouring the chocolates it was time for breakfast proper – posh eggs. In true Mr G fashion his plate was empty before I’d even managed to lift my fork to my mouth! I savoured the flavours of my breakfast. The bacon was lean and smoky, the egg yolks perfect, and the hollandaise sauce the best I’ve tasted. We both agreed that breakfast at Kimble’s should be repeated the next time we found ourselves in town, minus the hairy baby. With no time to linger, we rushed off for our first cultural fix of the day. The Gallery of Modern Art (GOMA) is as well-known for the statue which stands outside it, as the famous artworks which grace the gallery’s interior. It’s impossible to pass the statue of the Duke of Wellington without smiling. For many years, the duke has worn a traffic cone on his head. The city council waged war against his silly hat, but as soon as they removed it another appeared. Today, the statue is a well recognised symbol of Glasgow – the city with a great sense of humour. Inside, we were met by Nicola who took us on a guided tour of GOMA’s new Aaron Angell exhibition. Nicola was a fantastic guide, and gave us real insight into the story behind the exhibition, and also the museum building which was once the home of wealthy, tobacco merchant William Cunninghame. Aaron Angell’s exhibition which opened at GOMA on 8th December will run until 18th March. I loved finding out what inspired his works, and how they were created. GOMA received some pretty unusual deliveries when the exhibition was in the making. Pigs blood, empty pizza boxes, dead wasps – unusual, even for a gallery of modern art where wacky is the norm. Angell is a classically trained artist who specialises in ceramics. His exhibition cleverly, incorporates aspects of Ancient Rome into the artworks, which also play on a distorted sense of scale. Think giant cabbages, miniature Victorian ferns inside tiny glass-houses and huge Roman coins. With Nicola to show us around, the exhibition made perfect sense. I enjoy modern art, I’ve visited GOMA before and regularly visit Edinburgh’s Gallery of Modern Art. I’ll be honest though, I often look at installations and think what the hell am I looking at?! At GOMA I felt smug as I knew exactly what I was looking at! An artist’s interpretation of a Roman hypocaust heating system (inside a huge inflatable mattress), dead wasps symbolic of age and decay (also inside said mattress) and a classical painting of frogs and toads, on glass symbolising purgatory. Check me! After our tour finished we explored some of GOMA’s other highlights, before hot-footing it to the shore of the Clyde for more cultural enlightenment. We arrived at Glasgow’s award-winning Riverside Museum and were met by our guide Bob – a retired Firefighter and passionate local historian. We’d visited the museum before and loved it, but this visit was different as Bob really brought Glasgow’s rich social history to life. I took a trip down memory lane when Bob referred to a 1980s police vehicle as a jam piece. I hadn’t heard that term for years. If you’re wondering what a jam piece is, let me enlighten you. It’s a Scottish jam (jelly) sandwich. An apt description? You decide! My favourite part of the Riverside Museum is a historic street complete with vintage vehicles, shops, a bar and subway station. It’s very atmospheric, and walking on the cobbles it feels like you’ve travelled back in time. As we wandered Bob explained how petrol was once delivered by lorry to shops, to be sold in cans to early motorists. Today, it’s hard to imagine a life without petrol stations. Next, we popped into The Mitre Bar. A perfect recreation of a once popular Glasgow pub. This male only drinking establishment lacked tables, chairs and any form of home comfort. Men would stand cheek by jowl enjoying a pint (plus nip of whisky), a scotch pie and a smoke. Periodically they’d spit into a phlegm filled gutter on the floor. At a time when TB was rife the place must have been a health hazard. We learned about Glasgow’s subway next. The subway which opened in the 1890s is the third oldest underground system in the World. The people of Glasgow quickly fell in love with their new-fangled means of transport. In fact, Glasgow’s subway became so popular that picnics on board were soon commonplace. Families would purchase tickets and dine, as they repeatedly looped the circular track! To clamp down on this odd form of seat hogging tickets were changed to permit a single loop of the route only! The carriage interiors were beautifully crafted and the curved wooden seats surprisingly comfortable, so I can see why Glaswegians would have been drawn underground. Our tour ended beside a rare 1960s fire engine, and it was here that we discovered Bob was a museum exhibit himself. Staring at us from an information board was young Fireman Bob. He’d worked on the museum’s engine after joining the fire service in the early 1970s. Inside a display cabinet were a pair of his fire trousers, complete with a burnt knee. It was almost 2pm, 4 hours since we’d eaten and Mr G was starting to get hangry. We said our goodbyes and hurried off to Kelvingrove for lunch. We had a table waiting for us at Baffo Pizza & Birra, opposite Kelvingrove Art Gallery & Museum. Inside, the packed tables told us that this was a popular Glasgow eatery. I ordered a pinot grigio and Mr G a Peroni – when in Rome and all that. We both started with bruschetta classica. It was topped with a generous serving of juicy tomatoes and was extremely tasty. Next, a half metre long pizza served on a mini table! Who could resist? I should add that we shared a pizza, despite it being eat-till-you-burst season! After some debate we chose the Milanese pizza, which was topped with sugo, fior di latte, salami Milano and mascarpone. I asked for a serving of chillis to be added to my half. Not only would they guarantee my share of pizza would be safe from the clutches of chilli hating Mr G, but they would also give me a chilli fix – perfect. After photographing our gargantuan pizza, plus mini table we tucked in. It was tasty and the light, yet doughy crust was a work of art. It’s the nicest pizza base I’ve eaten outside of Italy. The chilli did the trick too. Mr G avoided my half of the pizza table, and my mouth burned like fire. Our final guide of the day was Gordon, a Duty Manager at Kelvingrove Art Gallery and Museum. The museum is the most popular free attraction in Scotland and the most visited museum in the UK outside of London. Quite some accolade, but you’ve only to step inside to understand why. Kelvingrove contains an eclectic mix of everything. Don’t like old paintings? No problem how about stuffed animals, Charles Rennie MacKintosh furniture or a Spitfire aeroplane hanging from the ceiling? Inside you’ll find something to suit all ages and interests. We wandered around the museum’s stunning interior with Gordon, our conversation triggered by what we saw around us. We lingered over an evocative painting of the Highland Clearances, empathising with the heartbreaking plight of the Highlanders who were forcefully evicted from their homes and often shipped off to foreign shores. We discussed how similar the paintings of the Glasgow Boys were to the French Impressionists. The Glasgow boys were a hugely, significant group of artists who painted in the late 19th and early 20th centuries. Most had links to Glasgow, where they lived, studied or had studios. They’re often referred to as the Scottish Impressionist, and looking at their paintings the similarities are hard to ignore. They were talented artists in their own right though, so I prefer the term Glasgow Boys. One of my favourite paintings in Scotland hangs in Kelvingrove. It’s by ‘Glasgow Boy’ Sir John Lavery. ‘Anna Pavlova as a Bacchante’ is a stunning painting which beautifully captures light and movement. It’s always captivated me. My taste in art is as varied as Kelvingrove’s collections. I love classical art, modern art and everything in between. I also like fun pieces that raise a smile. Kelvingrove houses two ‘fun’ favourites of mine. ‘Return to sender’ by Sean Read is a 7ft tall sculpture of Elvis, complete with fluorescent halo. It’s garish, creepy and like a surreal, 1970s Las Vegas nightmare – I love it. The other piece I love draws Instagrammers into the museum like moths to a flame. Sophie Cave’s floating heads were installed as a nod (get it) to the expressive nature of the exhibits in the hall they hang in. Each suspended head wears a different expression. It’s fun to walk round the upper level of the gallery to view them at close range. It’s a challenge to look at them without pulling silly faces. During the time we spent with Gordon we enjoyed a lengthy discussion about Scotland – the art, culture and history of the country, but most of all we discussed how wonderful and multi-faceted Scotland is. It’s somewhere you could spend a lifetime exploring, continually discovering new things. Outside, the museum looked really pretty, bringing some vibrant colour to a cold, dark afternoon. Our Glasgow day out had been wonderful from beginning to end. Keen to enjoy the city a while longer we popped into Porter & Rye on Argyll Street for a couple of champagne cocktails for the road. The Whiskey Champagne for me, and a lemony, French 75 for Mr G – mine contained a generous dollop of sugar – just to ensure my bloodstream wasn’t running low! Back home, the boy jumped for joy when he saw us and The Teen grunted a welcome of sorts. We shared some exciting news with the boy too. We’d be visiting Glasgow again in February, and he’d be joining us – hooray! Thanks to Suzanne at Glasgow Life for arranging our visit and fun-packed itinerary. Thanks also to Nicola, Bob and Gordon our excellent guides, and to Chris at Kimble’s for introducing us to Kimble’s delightful chocolates. As always, the opinions contained within this blog are entirely my own. One final thing. Happy New Year, and here’s to a healthy, happy and prosperous 2018. Lang may yer lum reek! Many thanks, once again, for a very informative and interesting blog and the lovely accompanying photos. I have to admit to knowing very little of Glasgow as, in the past, I’ve merely been passing through on my way further north. Next time I’ll ensure that I factor in enough time to experience and enjoy the obvious delights that this great city has to offer! 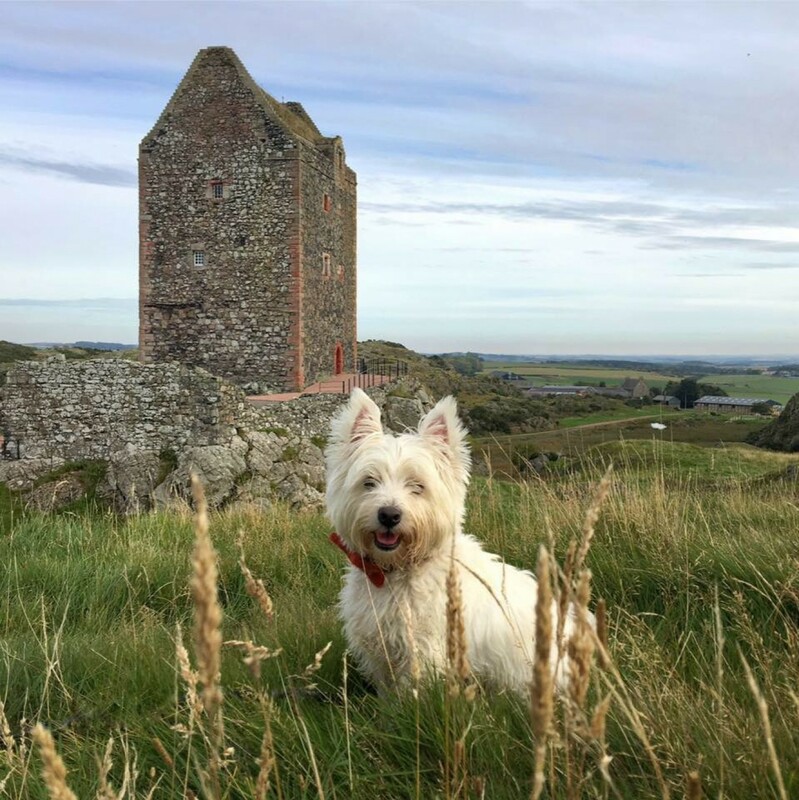 Many thanks too for your ‘Memorable Moments with a Wee White Dug’. I really enjoyed this compilation and it was good to have the opportunity to revisit the varied locations. Congratulations on your work of the last two years, Sam; certainly time well spent! Thank you. Very best wishes to you, Mr G, The Teen – and, of course, The Wee White Dug, for 2018. Best city in Scotland. Happy New Year. Loved this! Always head up to kelvingrove, transport museum, [riverside for the posh name] and people’s palace on Glasgow green whenever I,m back home. HNY to you and the family and thanks for sharing! Delighted by the reference to the jam piece! A “jammie piece” is one of the expressions our family continues to use to refer to a packed lunch. Funny the expressions that become part of a family’s colloquialisms. Happy New Year – really fancy having a look round Glasgow having read your post – usually sail through (or round) it en route to the Highlands…! Happy New Year to you too. You definitely need to visit Glasgow, it’ll surprise you. It’s a wonderful city. All the best to you, Mr. G, the Teen, and, of course, the wee white one. Please keep posting. You’ve such a wonderful way of expressing your delight in Scotland. I look forward to it always. Excellent post! We have put Glasgow on our list the next time we visit Scotland. Again, beautiful words. Happy New Year! What a fantastic post. It has been many years since I left The Dear Green Place and I still miss it. There is no doubt that the place has changed since we left and I expect I wouldn’t recognise much, but then, Argyle Street, Buchanan Street, Renfrew Street, Union Street; I don’t think it would take me very long to find my way about again. Before the commonwealth Games, I failed to understand some of the quite nasty comments that were made about Glasgow – particularly from a certain Minister in Glasgow South. Post games all I read were glowing reports. Anyway, A Good New Year, to you, Mr. G, the Teen and the Wee White Dug. Look forward to reading more posts in 2018.